On 15 July Brenda Milner reaches a remarkable milestone in anyone’s life: her hundredth birthday. Even more extraordinary for a woman who is still teaching and undertaking research. She is the Dorothy J. Killam Professor at the Montreal Neurological Institute, and a professor in the Department of Neurology and Neurosurgery at McGill University. Her achievements over her long career include the first description of amnesic patient Henry Molaison in 1957, as well as pioneering neuropsychological work on the hippocampus and memory, hemispheric specialisation and the functions of the frontal lobes. She is one of the great psychologists of the 20th century, and remains indomitable and a true inspiration for many. 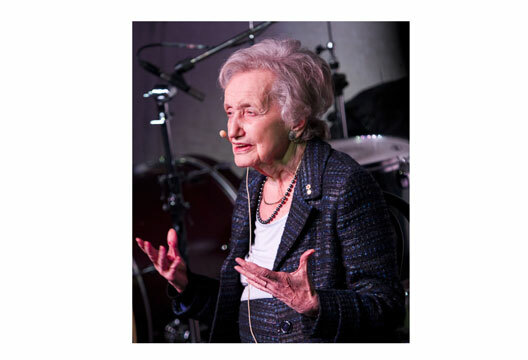 When Brenda Milner (née Langford) was born in Manchester, England in 1918, there was little to suggest she would become a renowned psychologist and one of the founders of cognitive neuroscience. Her father was a music critic for the Manchester Guardian who also gave piano lessons, her mother an office clerk from a broken home who left school at the age of 14. Her father also took to tutoring his daughter rather than sending her to school, with the result that she later recalled her home was filled with music, books on art, and many of the classics. She also began to learn German and French from her parents at a young age. But there was little in the household for the young girl to read on science. At the age of six years, she and her mother contracted influenza – most likely encephalitis lethargica – of which there was an outbreak in Britain in 1924. This disease was associated with a high rate of mortality, and sometimes led to sequelae such as post-encephalitic Parkinsonism, a condition brought to popular attention in the book and movie Awakenings. Fortunately, both mother and daughter recovered. Two years later her father succumbed to tuberculosis. That led to her education becoming more conventional, when she was obliged to join a local girls’ school. Withington Girls’ School – which still provides education for girls between the ages of seven and 18 – has a number of notable past pupils. Here, despite her strong background in literature and languages, she became enamoured by ‘the beautiful logic’ of mathematics, an interest that led her to win a scholarship at the all-female Newnham College, Cambridge in 1936. Her fascination with mathematics would wane, however, after only one year when concluding she was not going to distinguish herself in the discipline. Looking around for another subject, she considered philosophy, but was dissuaded when the senior members of her college pointed out it was unlikely she would earn a living from its study. Instead, she plumped for psychology – a subject she knew absolutely nothing about. She quickly realised that her new subject suited her inquisitive temperament – and she graduated with an upper second BA degree in experimental psychology in 1939 (a grade she ‘hated’ obtaining). The most important influence on her during her time at Cambridge was Oliver Zangwill, a research student in the laboratory of F.C. Bartlett, who acted as her supervisor and tutor from 1937 to 1939. According to Milner, he was particularly important in impressing upon her the value of studying the behavioural effects of brain damage as a means of gaining important insights into the normal functioning of the brain. Later, in 1952, Zangwill would become Professor of the Psychology Department, where he is widely credited with establishing the science of clinical neuropsychology. After obtaining her degree, she was awarded a studentship by Newnham College, which allowed her to pursue postgraduate research. The outbreak of the Second World War in 1939, however, meant this work had to be redirected towards the war effort. Consequently, she became part of a team involved in developing selection tests for fighter and bomber pilots. At the end of her studentship in 1941, she moved to Christchurch in Dorset, where she evaluated types of radar display for the military. Although she spent only six months in Christchurch before being relocated to Malvern in 1942, it was nevertheless a significant point in her life, for it was here she met a young electrical engineer from Leeds University called Peter Milner – who was to become her husband. The small town of Malvern also proved congenial, and she spent two and a half pleasant years there. By mid-1944, it had become clear the war was ending, and she was invited back to Cambridge. Although she was happy to be back at university, that same year Peter Milner was unexpectedly invited to join a small group of physicists to work on an atomic energy project in Montreal, Canada. Now in a close relationship with Brenda, and not wanting to go to Canada without her, the two agreed to a quick marriage at a register office to allow them time to make the necessary travel arrangements. After ‘scrounging’ some stout wooden boxes to transport their books, the newlywed couple boarded the Queen Elizabeth in Glasgow along with the war wounded and GI brides. They had just five pounds in sterling between them. It was also a perilous journey due to the patrolling German U-boats, and the ship had to take a lengthy zigzag course to safely reach Boston, although New York was their original destination. On arrival in Montreal, Peter took up his new post while Brenda looked around for work. She had hoped to find a position in the Psychology Department of McGill University, only to find the war years had caused it to fall into a dilapidated state. Despite this setback, she got a position teaching psychology, in French, at the nearby Université de Montréal which was run by Dominican monks. Although she had spoken little French since high school, she had read a great deal of French literature, and found her new experience exotic and stimulating. She would lecture there for seven years. But, it was McGill that continued to attract her, and in 1947 its Psychology Department received a boost with the arrival of Donald Hebb – who was also at the Montreal Neurological Institute (MNI) to assess the patients of Wilder Penfield undergoing brain surgery. Hebb had also just completed The Organization of Behavior and used the manuscript chapters for a series of evening seminars that attracted a small but devoted group of participants. Inspired by the debates, Brenda Milner cautiously approached Hebb in 1949 and ‘persuaded’ him to let her do a PhD. Soon after starting her PhD, in June 1950, she was offered the chance of working at the MNI testing the cognitive effects of temporal lobe ablation. It was an offer she could not refuse. At the time, little was known about the effects of temporal lobe lesions, and she was armed with little more than a few simple tests bequeathed to her by Hebb. Thus, Milner had to rely heavily on animal studies to assess what deficits she was likely to find. One known effect in monkeys, reported by Kluver and Bucy in 1938, was a flattening of emotion, along with an odd abnormality known as psychic blindness. A few years later, Mishkin and Pribram showed that inferotemporal cortex lesions in monkeys impaired performance on visual discrimination. As a result, Milner began testing her patients on tasks requiring them to spot visually incongruous objects in picture scenes – work that was to show perceptual deficits that became more marked after right-hemisphere lesions. By now, Penfield was beginning to be a little more adventurous with his surgery. At first, he had usually confined his lesioning to the most anterior regions of the temporal cortex. This produced little impairment, although it was not always successful at curbing the seizures, with the result Penfield began extending his lesioning to more medial parts of the temporal lobe including the amygdala and hippocampus. In some instances this led to unexpected effects. One case was a civil engineer known as PB. Following a second operation in the early 1950s that invaded his left-sided medial temporal cortex and hippocampus, he experienced severe anterograde amnesia. At first, this was considered a unique case. But in 1952 another patient, FC, suffered a similar deficit after a temporal lobotomy which included parts of the hippocampus. In 1955 these two cases were presented to the American Neurological Association in Chicago. A few days later, Penfield received a call from William Scoville who practised neurosurgery in Hartford, Connecticut. According to some accounts, Scoville was a brash character, known for his reckless driving and high-risk pranks, such as climbing the cable tower of the George Washington Bridge at night. At the time, lobotomies were being performed regularly in the US to treat various forms of mental illness – and Scoville was at the forefront of this ‘psychosurgical’ movement. Penfield was told that Scoville had observed a pronounced memory loss in one of his own patients, who had received a bilateral lesion of the medial temporal lobes for the treatment of his epileptic seizures. As a result, Milner was invited to travel to Hartford to study the patient’s amnesic syndrome. The patient, of course, was Henry Molaison, known at the time by his initials HM, who is perhaps the most famous patient in the annals of memory research, if not psychology itself [see tinyurl.com/psychHM for one discussion of the case and an evaluation of its significance]. But when Milner first visited HM, she was shocked to see his memory impairment was far worse than expected. To a casual observer, HM appeared normal, yet he forgot the daily events of his life almost immediately they occurred. Milner performed a couple of simple memory tests on 26 April 1955, and the results were published along with an account of HM’s surgery in 1957. The paper (Scoville & Milner, 1957) has since become one of the most frequently cited in the history of neuroscience with over 2500 citations in major journals. One of the reasons for this interest lay in the fact that hitherto the hippocampus had been almost overlooked as a brain structure involved in memory. Milner’s work with HM was to be continued over five decades, and it established the crucial role of the hippocampus in the consolidation of long-term memory. Her testing also led to the growing realisation that multiple memory systems existed in the brain, with the hippocampus involved in a system responsible for declarative or conscious recollection of information – but not in procedural or motor-based memory. In fact, Milner was to demonstrate the intact procedural ability in an early experiment when she found HM was able to learn to draw accurately around a complex shape (a star) using a mirror for visual guidance, which improved over several days, although he never had any conscious recollection of the task. If these advances into understanding the hippocampus were the only accomplishments of Milner’s, then they would be sufficient for her to be placed into the pantheon of great psychologists. But, there would be much more to come. During the 1960s she began working with Theodore Rasmussen at the MNI, using the Wada technique to test lateralisation of function in the cerebral hemispheres – research showing how the hemispheric representation of language can vary as a function of handedness. Another part of the brain that Milner explored was the role of the frontal cortex – a region that she particularly enjoyed testing in her lesioned patients. Her work would highlight the behavioural inflexibility and poor planning of individuals with frontal lobe damage – and she identified the dorsolateral region as particularly important in the temporal organisation of memory. More recently, and well into her eighties and nineties, Milner has adopted the use of fMRI and PET scanning to examine the brain regions involved in spatial memory and language, including the neural basis of unilingual and bilingual speech. Brenda Milner remains at the top of her profession, working three days a week, with a research career that has lasted over 75 years. Her only shortcoming, it seems, is that she now sometimes forgets people’s names. Making money has never been a concern for her, nor has she wanted children – she told the American Academy of Neurology’s Oral History Project in 2011: ‘I have never wanted children. I mean, that was very, very clear: I was a person who would go out on a first date with somebody and manage to introduce this fact into the conversation. So people just knew where I stood’. Brenda and Peter Milner divorced in 1970 although they remain the best of friends, and speak almost every day since they live just a couple of blocks apart [Editor's update: We were sad to learn, after going to press, that Peter passed away recently]. She does not have a car and walks to work most days. In addition she enjoys nice food and good wine on occasion, and has also remarked that she likes working with men and experienced little discrimination. Milner has received many honours, which are too numerous to list here – although special mention can be made to the Companion of the Order of Canada, which was awarded in 2004, and which recognises the highest degree of merit to Canada and humanity in general. Milner admits she is still curious and nosey – attributes that should inspire any aspiring psychologist who is keen to understand the brain and its cognitive functions. - At the end of December, 2016, Andrew Wickens left his post as Senior Lecturer at the University of Central Lancashire after 27 years, to concentrate more fully on his writing career. He, nonetheless, maintains strong links with its Psychology Department. Find more on HM in our archive.